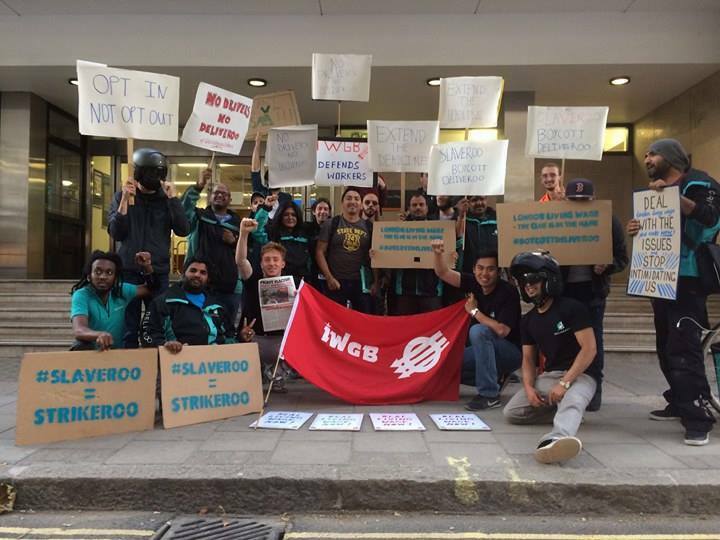 London based workers from the delivery firm Deliveroo, today won their strike against management who sought to impose a new contract upon them that would have seen that being paid £3.75 for each Delivery as opposed to the £7 p/h plus £1 for delivery they will now stay on. In disgust at the new unfair contract that was be imposed upon them, the workers took matters into their own and called a immediate strike. They did so informally, as union organisation in their sector is virtually non existent. This is known as a wildcat strike. The workers organised a series of flying pickets and demonstrations that received a lot of attention from the public and the mainstream media. Then, working together with our friends over at the Independent Workers Union of Great Britain Couriers and Logistics Branch (@IWGB_CLB on Twitter) they rejected the feeble offer from the bosses to meaningless consultation in favour of demanding a fair wage for their gruelling and dangerous work. Needless to say this an incredible victory for grassroots unionism and the IWW sends all our congratulations to the Deliveroo workers. Many of our members went down to the pickets to show solidarity. We hope there will further organisation among fellow workers as many of us find ourselves in more and more precarious employment. Can’t wait to see what happens next!